Cartoons of the Prophet Muhammad published in several European newspapers have caused outrage among some Muslims. The BBC News website looks at the key questions behind the row. What do the cartoons portray? The 12 cartoons published on 30 September 2005 by the Danish newspaper Jyllands-Posten show the Muslim Prophet Muhammad in a variety of humorous or satirical situations. The pictures accompanied an editorial criticising self-censorship after Danish writer Kare Bluitgen complained that he was unable to find an illustrator for his children's book about the Prophet. Some of the images appear to be quite gentle in their message - the Prophet wandering through the desert with the sun setting behind him, or his face merging with an Islamic star and crescent. Others, however, seem to be more deliberately provocative towards Muslims, most notably showing Muhammad carrying a lit bomb on his head decorated with the Muslim declaration of faith instead of a turban. One shows Muhammad brandishing a sword ready for a fight. His eyes are blacked out while two women stand behind him with their Islamic dress leaving only their eyes uncovered. Another image shows Muhammad standing on a cloud holding back a line of smouldering suicide bombers, saying: "Stop, we have run out of virgins" - a reference to the supposed reward for Islamic martyrs. What does the Danish newspaper say about the cartoons? Jyllands-Posten's culture editor, Flemming Rose, says he did not ask the illustrators to draw satirical caricatures of Muhammad. He asked them to draw the Prophet as they saw him. Rose has insisted that there is a long Danish tradition of biting satire with no taboos, and that Muhammad and Islam are being treated no differently to other religions or religious figures. He also argues that the images have raised the profile in Denmark of a debate on integration of religious minorities. 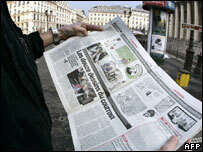 On 30 January, the paper published a statement saying: "In our opinion, the 12 drawings were sober. They were not intended to be offensive, nor were they at variance with Danish law, but they have indisputably offended many Muslims for which we apologise. " Newspaper editors who have republished the cartoons say they are defending the right to free speech and acting in solidarity with Jyllands-Posten. The cartoons were republished in Austria in January, and then at the beginning of February in a number of European newspapers in France, Germany, Italy and Spain. Diplomatic protests by governments of Islamic countries started in October 2005, escalating to the closure of embassies. Boycotts of Danish products and protests across the Islamic world built up in late January and early February. In the Palestinian territories, armed groups have made direct threats against citizens of the countries in which the cartoons were published. There have also been death threats against the artists. On 2 February, Danish Prime Minister Anders Fogh Rasmussen appeared on Arabic TV to apologise for offence caused by the cartoons, but he also defended freedom of expression. There have since been angry and sometimes violent protests across the Islamic world, and in Britain and France. What do Muslims say about the cartoons? Many Muslims say that the cartoons are extremely and deliberately offensive, expressing a growing European hostility towards and fear of Muslims. The portrayal of the Prophet Muhammad and Muslims in general as terrorists is seen as particularly offensive. Some Muslims see the cartoons as an attack on their faith and culture designed to sow hatred. Has Muslim reaction to the cartoons been uniform? Not at all - some Muslims have accused protesters of overreacting. A weekly newspaper in Jordan reprinted some of the cartoons and urged Muslims to "be reasonable". Websites produced by and for Muslims have shown the cartoons or linked to them. One liberal website said Muslims were making a mountain out of a molehill. Some Muslims, mainly in Europe, have supported the re-publication of the images so that individual Muslims can make their own minds up and welcomed the debate on the issues that the cartoons have raised. It has also been pointed out that cartoons in the Arab and Islamic press "demonising" Israelis and Americans using Jewish and Christian imagery are common. What are the issues raised by the cartoons? In many European countries there is a sense of secular values being under fire from conservative Islamic traditions among immigrant communities. Many commentators see the cartoons as a response to this. There are also issues of integration - how much should the host society compromise to accommodate immigrant populations, and how much should immigrants integrate into the society they are making home. Some commentators have defended the cartoons, saying they address fault lines in changing European societies that need to be discussed more openly. However, Arab and Muslim commentators say the issue and furious reaction must be understood in the context of Islamophobia, the perceived oppression of Muslims in the Middle East conflict and the US-led "war on terror". Culture clashes of this kind are not new. In 1989 Iran's spiritual leader Ayatollah Khomeini called on Muslims to kill British author Salman Rushdie for alleged blasphemy in his book The Satanic Verses. This may be closest comparison to the current situation. It raised many of the same issues - sensitivity of host cultures to religious sensibilities, integration of immigrants, religious intolerance and freedom of speech. It took many years for the controversy over Mr Rushdie's novel to fade away, and for the author to emerge from hiding.